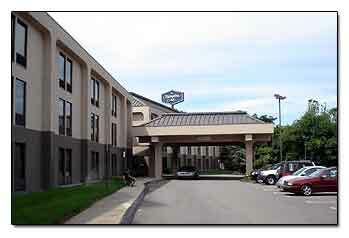 Here's a picture of the Hampton Inn motel where are relatives stayed when they came to Connecticut. The relatives are spending four days here. The rooms are very nice, yet seemed a little small. They have a complimentary breakfast between 6am and 10am which we took advantage of. Even though it was the July 4th holidays, they didn't seem to be overbooked. The front desk personal went out of their way to make our stay enjoyable. This is the room we stayed in as guests to our relatives. All we needed was a double bed. They had cable TV of course, and as you can see, we brought our laptop so we could play on the computer which was WIFI accessible. 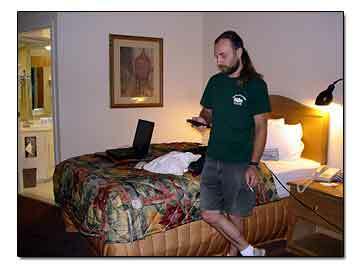 The Hampton Inn was easily accessible from Interstate 95. If you exit 36 from New York, it's right there at the end of the ramp. From New York Exit 36, and the end of the exit make a right. From New Haven Exit 36 and make a left, it's a couple of blocks down on the left.